Aldo lived 20 years with vision problems. Living in Mexico City for part of his life, constant sun exposure and the air quality caused his eye health to deteriorate. The pain was so consistent that he became used to it. Once he started working in Orange County at a warehouse, he noticed that being around chemicals irritated his eyes and he decided to change jobs; working at a car wash and as a gardener, both jobs requiring him to be outdoors. He quickly noticed the toll this took on his vision but had no choice but to continue working to sustain his family. 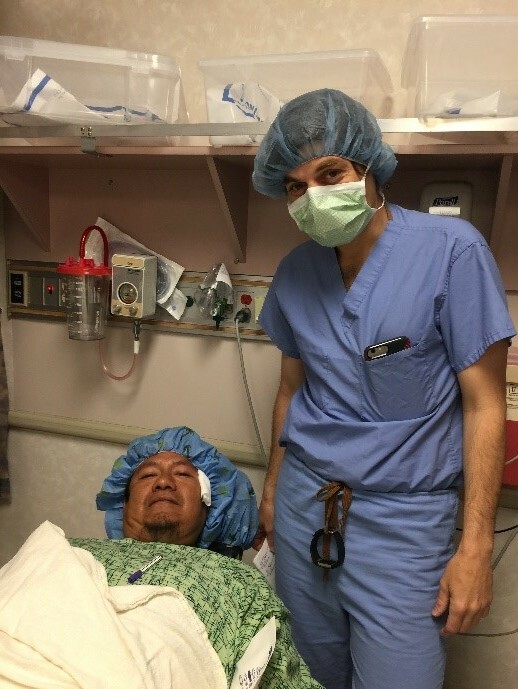 On April 17, 2018, Dr. Ghosheh performed surgery to remove the cataract that was slowly affecting his vision and quality of life. Dr. Ghosheh knew eye drops would only be a temporary solution so he opted to perform surgery and give Mr. Gutierrez a better outcome. Aldo wants to give a special thanks to Noemi Grabiel, Program Manager at AccessOC for coordinating his surgery and giving him the opportunity to see again. “She was with me every step of the way, she listened to me and was compassionate, thank you Mrs. Grabiel for everything that you do”. He expressed his gratitude to the entire team and now enjoys life with good vision.